Truckee junior Oscar Ingnez competes in the regional championship tournament on Thursday. The top-seeded Truckee girls soccer team advanced to the Northern Division I-A final and secured a state championship berth with a 2-1 overtime win over Fallon in Elko on Friday. 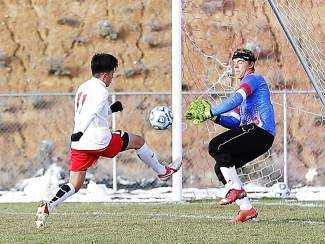 The Wolverines will face second-seeded South Tahoe, which defeated Spring Creek 5-2 on Friday, for the regional title Saturday at 10 a.m.
Truckee’s defending state champion boys were eliminated from the postseason after defeating Spring Creek 3-0 in the quarterfinal round Thursday and then losing 2-1 to Elko in the semifinal on Friday. Check back for more information and the girls’ regional championship results.